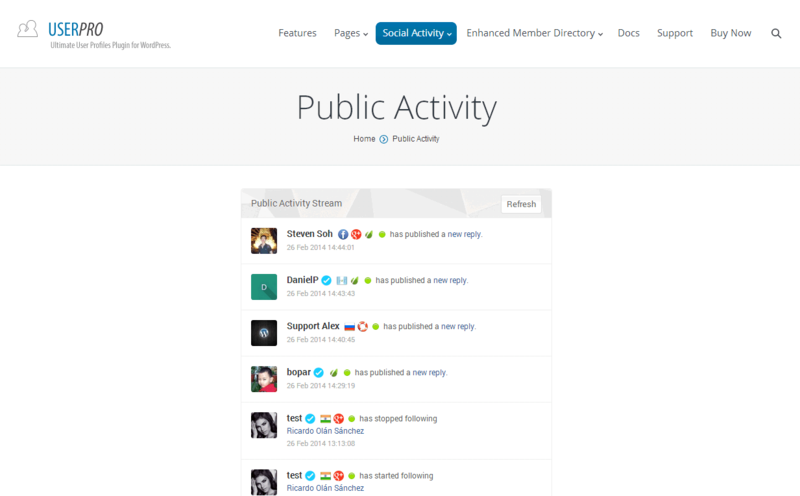 Do not send your regular members to backend, let them publish directly from frontend. 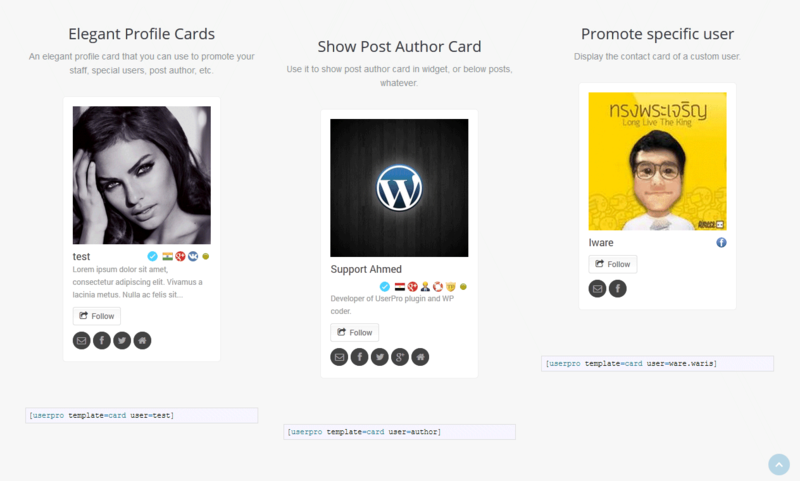 It supports all custom post types and post categories. Show posts made by user/author on wide content area as well as on sidebar. 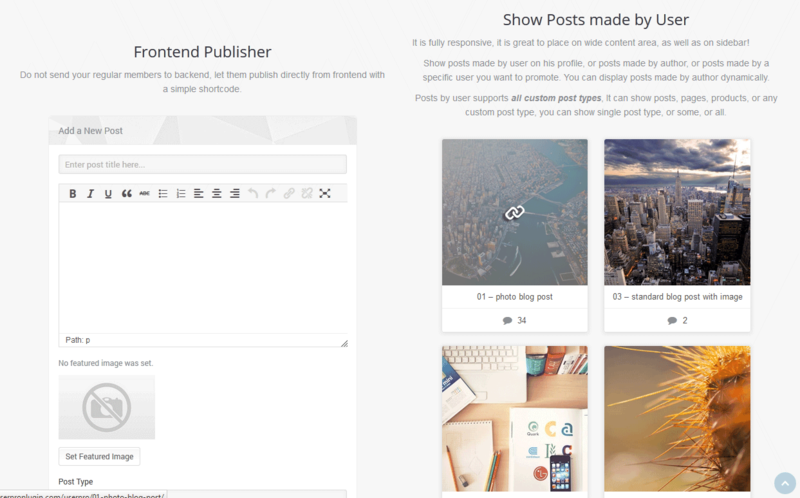 Show posts by author dynamically. 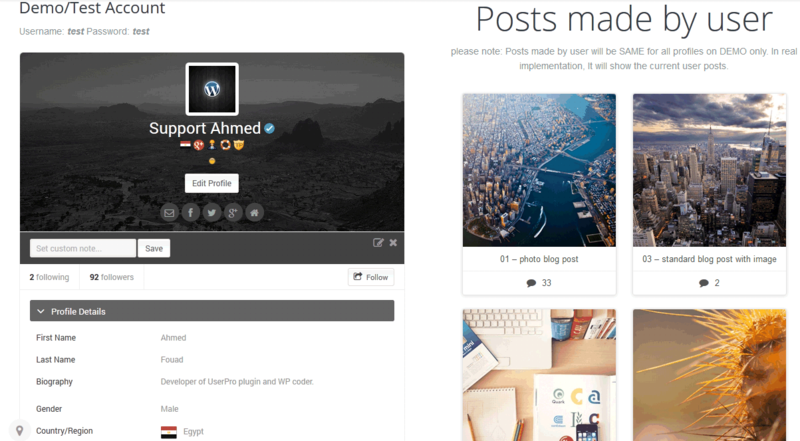 This fully responsive posts by user can be included in User’s profile as well. 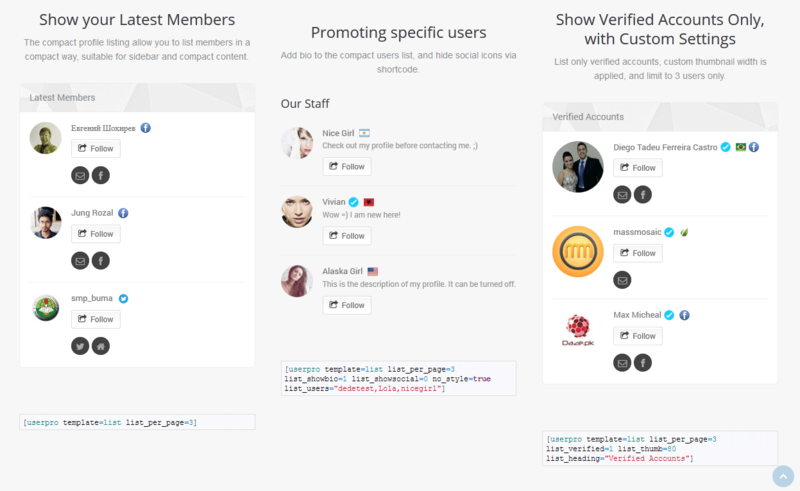 Manually or automatically assign badges to user roles and display the same on profile page. 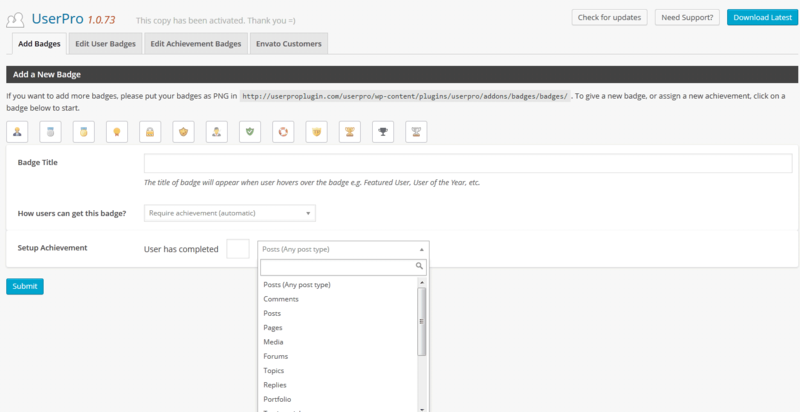 Supports custom badge upload feature. Restrict full page/post per user roles or for Verified Accounts. Lock entire site/specific page for logged out users. Enable social connect and instant profile sync via Facebook, Twitter, Google+, Bkontakt, LinkedIn and Instagram. Enabled auto-posting on Facebook (when a user publishes a new post via FrontEnd publisher or when a user follows someone). Integration with MyCred.User Points / Awards system is now available through myCRED add-on integration. Try it out! An easy-to-use API, hooks and filters everywhere to help you integrate with any system and modify it to your needs! Frontend password reset and password change. A unique front-end password reset tool! Users will never see your website’s back-end. Users receive a secret key (custom e-mail) and they can reset account password by validating their code. 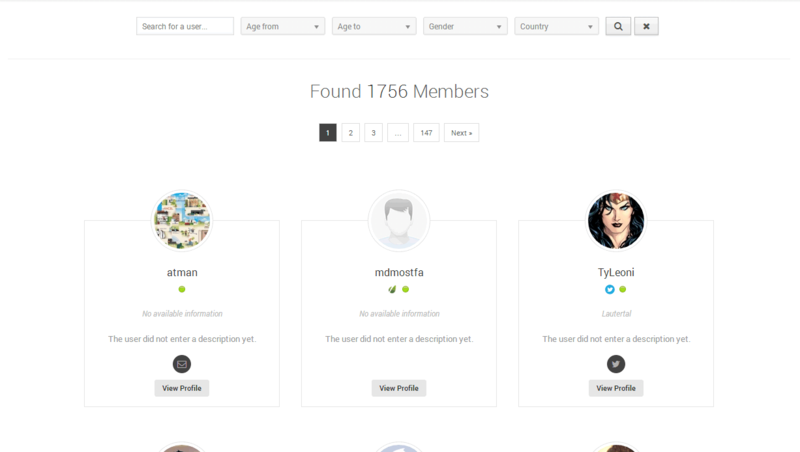 Manually Approve New Users, Require e-mail validation, or Auto-Approve new signups! Custom e-mail notification to invite users to Get Verified! Responsive photo uploads with Lightbox support! Subscribe to our Newsletter to receive all the latest UserPro news and updates. - Fixed bug : Fields lock functionality is not working. - Fixed bug : Redirects are not working after login/register. - Fixed bug : Connection button reloads profile page. - Fixed bug : User waiting approval can login to the website. - Enhancement : Users exclude from list template. - Fixed bug : FontAwesome 5 not working. - Fixed bug : Manually add badge for user functionality returns Fatal error. - Fixed bug : Restrict page functionality not working. - Fixed bug : Admin top bar appears for all users. - Fixed bug : Emd layout not working. - Fixed bug : Languages text domain not working. - New feature : New profile layout. 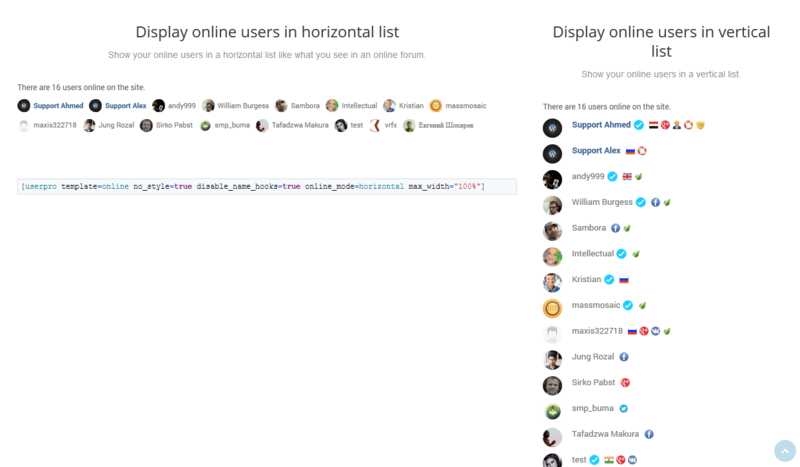 - New feature : Invited users list. - Fixed bug : Modern layout styles breaks page design. - Fixed bug : User invitation validations. 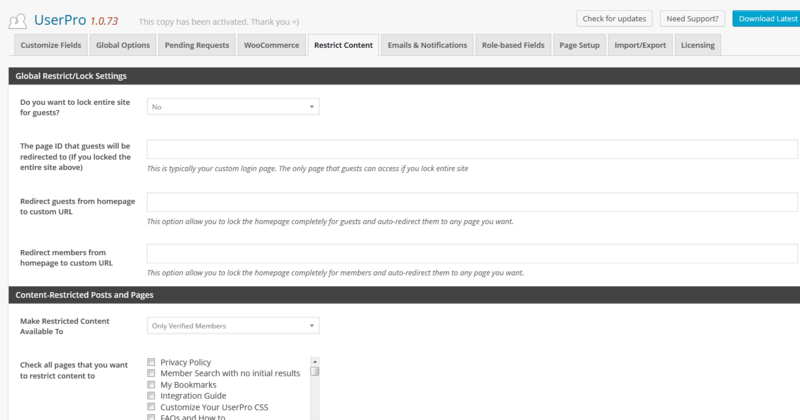 - Fixed bug : Fixed an issue where wp top bar wouldn't hide for non admins with back-end access. - Enhancement : Added ability to disable Ajax for login and registration. 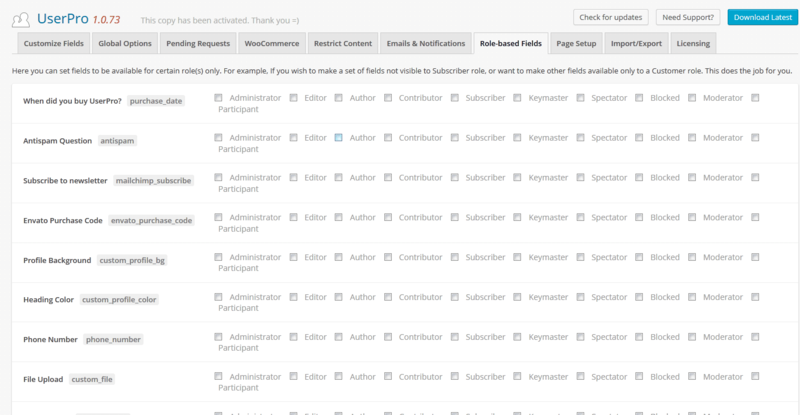 - Enhancement : Admin dashboard styles changes. - Enhancement : Added CC emails to invite users functionality. - Enhancement : Added "Rejected User Email". - Fixed bug : Removed GET parameter from Linkedin redirect url. - Fixed bug : Removed GET parameter from Google+ redirect url. - Fixed bug : Removed GET parameter from Instagram redirect url. - Fixed bug : Removed GET parameter from Twitter redirect url. 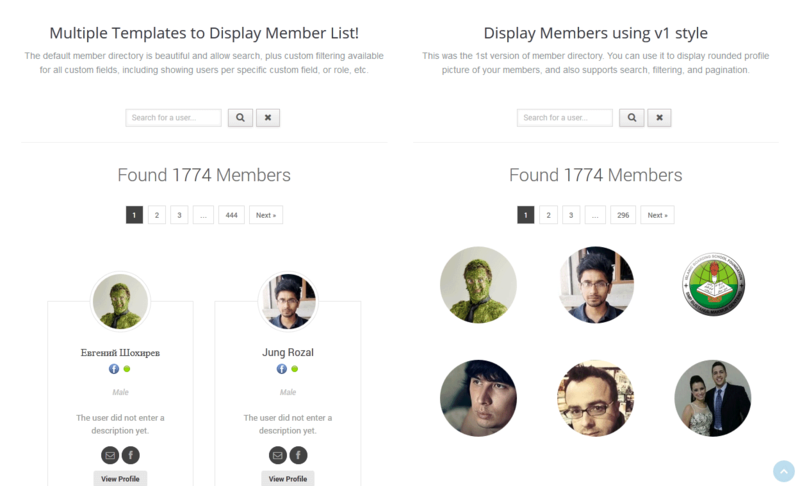 - Fixed bug : Memberlist responsive issue. - Fixed bug : Google maps not working on user profile. - Fixed bug : Broken email invitation link. 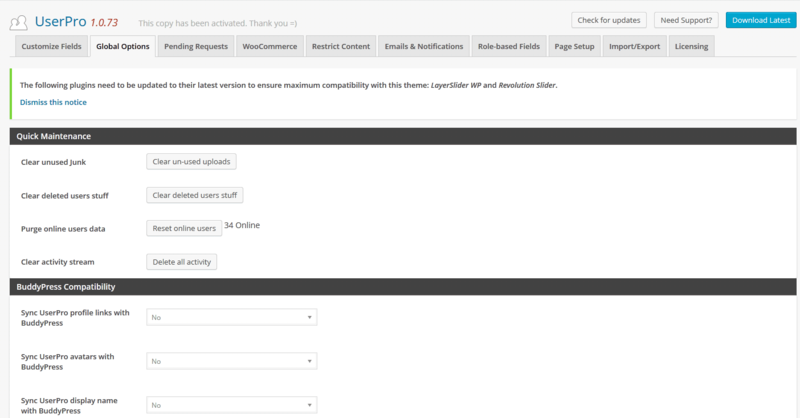 - Enhancement : MailChimp API version upgrade from 2.0 to 3.0. - Security fix : Register user with administrator role. - Fixed bug : Message "Please correct field" can't be translated. - Fixed bug : Facebook login works only after the second click. - Fixed bug : Removed deprecated function openssl_encrypt. - Fixed bug : Registration ajax bug. If display name was empty redirect not working. - Fixed bug : UserPro settings can't be cleared (roles that can edit other users profile, roles that can view other profiles). - Fixed bug : If user haven't email address get an error (trying to get property of non-object). - Fixed bug : Conditional fields not working with select fields (trying to get property of non-object). - Fixed bug : Avatar upload internal server error fix. 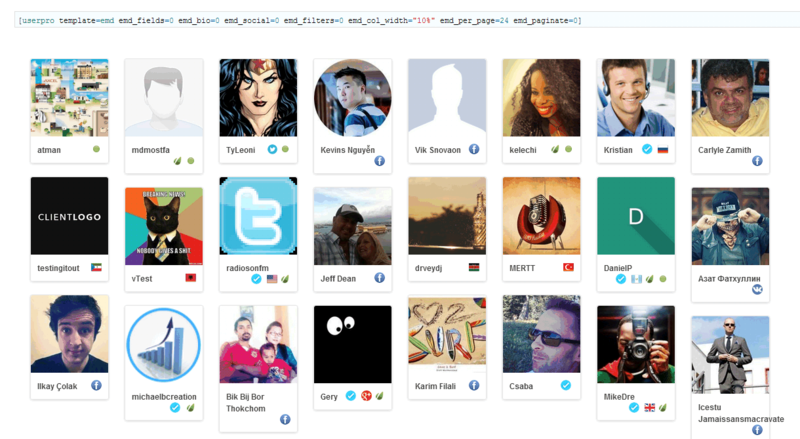 - Enhancement : View user profile button on default WordPress User section. - Enhancement : Pagination for User Request awaiting manual approval. - Fixed bug : LinkedIn social login redirect url setting validation fix. - Enhancement : Linkedin social login update (https://docs.userproplugin.com/knowledge-base/setting-up-linkedin-connect-from-version-4-9-24/). - Enhancement : Google+ social login update (https://docs.userproplugin.com/knowledge-base/setting-up-google-connect-from-version-4-9-24/). - Enhancement : Twitter social login update (https://docs.userproplugin.com/knowledge-base/setting-up-twitter-connect-from-version-4-9-24/). 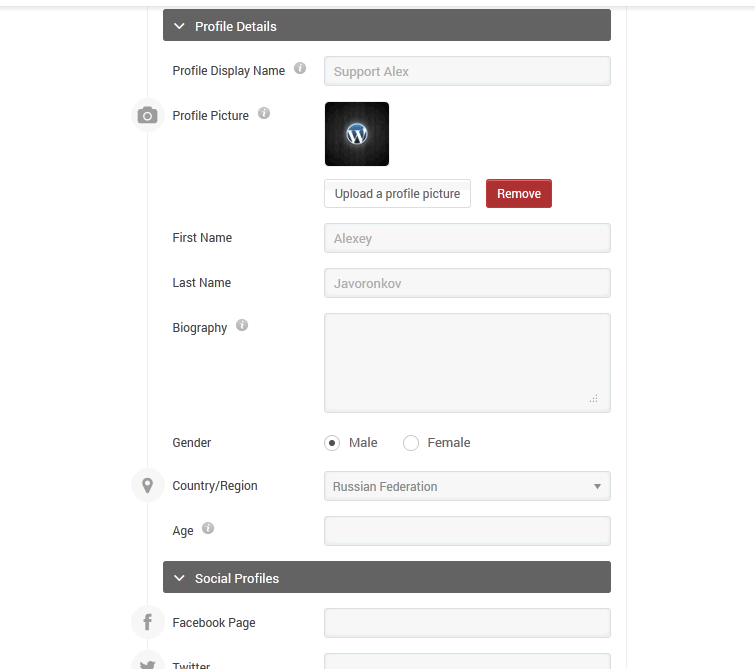 - Enhancement : Instagam social login update (https://docs.userproplugin.com/knowledge-base/setting-up-instagram-connect-from-version-4-9-24/). - Fixed bug : Followers and Connection pages can't have parent page. - Fixed bug : Login redirect on [userpro template=login] shortcode not working. - Fixed bug : Conditional rules not working with file input field. - Fixed bug : Linkedin auth bug fix. - Fixed bug : Post by user filter not working. - Enhancement : Added translatable strings in input placeholders. - Enhancement : GDPR compliance update (double opt-in changed from false to true). - Fixed Bug : Cleaned up code, fake Avast alert problem. - Enhancement : User verified date added. - Fixed Bug : WP super cache, cookies caching problem fix. - Enhancement : If form role not empty in the shortcode set user role. - Fixed Bug : Registration email domains block fix. 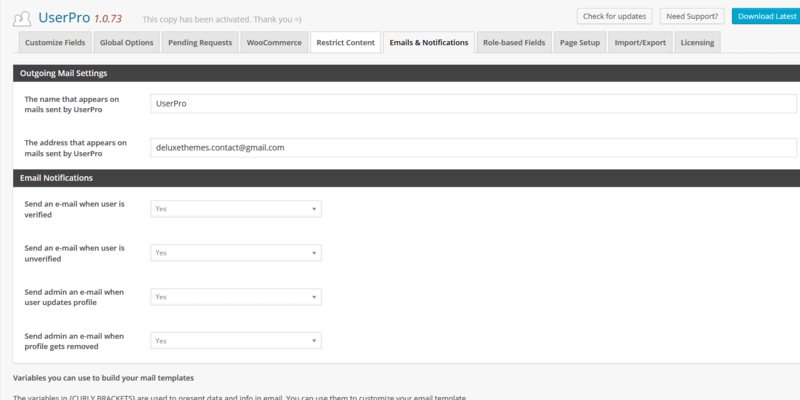 - Enhancement : Email validation for blacklisted emails. - Enhancement : Redirection fix on registration shortcode. Redirect if redirect_uri not empty. - Fixed Bug : Trim spaces from blocked emails values. - Fixed Bug : Chosen library dropdown fix. - Security Fix : Registration role validation fix. - Security Fix : File upload security update. - Enhancement : Added ability to translate profile input fields labels. - Enhancement : FontAwesome updated to version 4.7.0. - Fixed Bug : On invated user email uppercase not validate. - Fixed Bug : Facebook modal pop-up login doesn't refresh/redirect page. - Fixed Bug : Removed white spaces and symbols from the email on the registration page. - Enhancement : Chinese translation update. 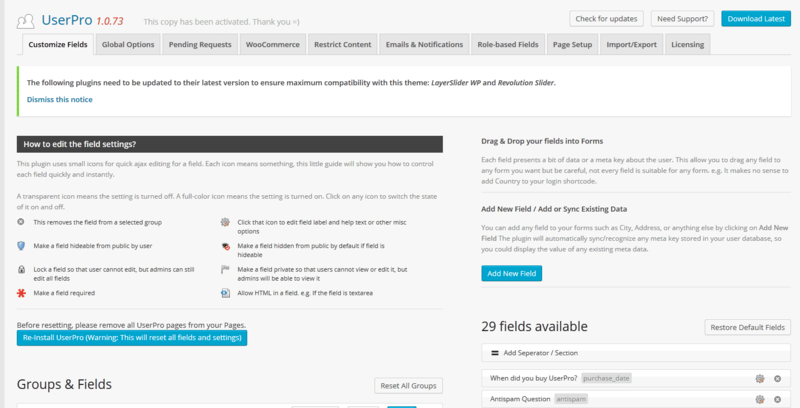 - Fixed Bug : Total theme customization 'Save changes' button inactive. - Enhancement : Profile title translation update. - Fixed Bug : while uploading the featured image from front end publisher, image height gets too large.